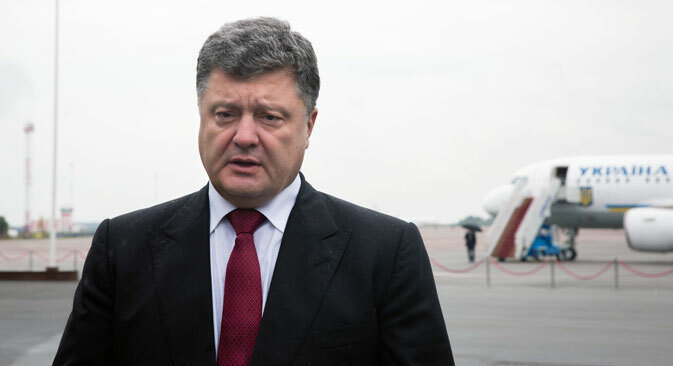 Ukrainian President Petro Poroshenko has canceled his working visit to Turkey because of an escalation of fighting in the Donetsk Region in eastern Ukraine and has called an extraordinary session of Ukraine's National Security and Defense Council. RBTH brings you the latest on the situation in Ukraine. From 12:10 p.m. to 4:09 p.m. GMT, RBTH provided a live-feed of developments regarding Petro Poroshenko’s announcement of the presence of Russian troops in Ukraine. Tune in tomorrow for further updates on this situation. 1:26 p.m. GMT: Civil society activists are holding individual protests against the war in Ukraine on Manezhnaya Square in central Moscow. "No war with Ukraine", says poster. 1.21 p.m. GMT: Ukraine will withhold all information about the movements of its military forces. “Today no information concerning the redeployment of the Ukrainian armed forces will be made public, because following a report yesterday that troops had advanced into Starobeshevo, they came under fire from Grad rockets. The position of the Chief of the General Staff is that all information is to be kept secret,” announced Gennady Zubko, first deputy head of the presidential administration of Ukraine, reports Gazeta.ru. 1.12 p.m. GMT: Hundreds of people staged a protest in front of the Ukrainian Ministry of Defense on Thursday, according to Rossisykaya Gazeta, citing RIA Novosti. Among other things, the protestors demanded the resignation of Ukrainian President Petro Poroshenko. According to reports, relatives of Ukrainian military personnel taking part in operations in eastern Ukraine are taking part in the rally. According to the website ok-inform.ru, some protestors are using obscene slogans referring to Russian President Vladimir Putin while other protestors are calling for "purification of Ukraine," "continuing the national revolution," or "death to the enemies of Ukraine." 1:12 p.m. GMT: Meanwhile more than 500 activists have gathered in front of the Ukrainian Defense Ministry headquarters on Povitroflotsky Avenue in Kiev to protest against inaction of the ministry and the General Staff leadership in breaking the blockade of Ukrainian government forces in Ilovaisk, the Donetsk region. 12:33 зp.m. GMT: The announcement made by Petro Poroshenko about the alleged deployment of Russian troops in Ukraine is a provocation, said Vice Speaker of the Federation Council Yevgeny Bushmin in comments made to RIA Novosti. 12:13 p.m. GMT: Russia's stock indices fell sharply on Aug. 28 following Poroshenko's statements, according to Vedomosti. The RTS index decreased by 3.13 percent and the MICEX fell by 1.61 percent. The value of the ruble also fell against the dollar and the euro.